Tsambikos (Jim) Damianos was born in the village of Dimilia on the island of Rhodes, Greece in 1896. In his early 20’s, he left home to work as a construction laborer in Turkey to earn enough money to immigrate to the US. From Ellis Island, he settled for a short time in Connecticut but picked up and headed for Pittsburgh where work in the steel mills seemed promising. Being a steel worker did not appeal to Jim, so he joined the US Army as a “dough-boy.” He was shipped to France where he met and married Melanie Barboteau and brought her back to McKeesport, Pennsylvania as a war bride in 1919. Jim’s family life always centered on food. Originally, he opened a small restaurant/grocery store in a “hole-in-the-wall” across from the Tube City Brewery Company in McKeesport. In 1927, Jim bought a house at 1350 Walnut Street to relocate the business. Half of the first floor was converted into Jim’s Restaurant, and the enclosed front porch became the entrance. The restaurant kitchen was the ground floor access to the family home on the second. The coal for the furnace had to be hand-shoveled from the sidewalk through a chute. An icebox on a porch provided refrigeration. All meals and sandwiches for family, friends and newly arrived immigrants from Greece were prepared in the restaurant (the family’s dining room was rarely used). Two memorable restaurant features were a circular plastic enclosed pie rack that held six to eight pies and a Taylor brand ice cream machine. Jim’s friend, “Tippy” delivered five-gallon containers of cream for making ice cream in a Menzie Dairy horse-drawn carriage. Made daily, the ice cream was enhanced with fresh fruit or walnuts as the ice cream was discharged from the machine. The entire family worked in the store. Children Al (b.1920), Gus (b.1926), Juliette (b.1930) and Syl (b.1933) had varying times of involvement - but Jim and his wife Melanie were tireless in managing the restaurant. After World War II, Jim felt that McKeesport was fading and that he should relocate to an area where veterans and their families were settling - and that they would need a grocery store in addition to the restaurant. A two-story building, with living quarters behind and above a grocery store, was erected at 2600 Skyline Drive in West Mifflin, midway between Dravosburg and Duquesne. The family moved into the building in the fall of 1948. The timing was awful! The veterans were buying cars and driving to the new shopping centers making a local grocery store an unnecessary convenience. Jim was at a low point; he decided to return to the restaurant business and sold all of the coolers, display cases, etc. Booths and counter stools returned, along with a new combination grille/broiler/oven that Jim created - and a brand new soda fountain! The restaurant was not an immediate success and Jim was not happy with people loafing in the booths. One day, Syl came home from school to find that the booths had been totally removed. His father said that customers could eat at the counter, in their cars, or at home! Business began to increase. Jim never hesitated to make a major change if he felt things were not going right. Months later, the stools were gone! Jim was tired of washing dishes and decided that customers could stand up and eat, sit in their cars, or take the sandwiches home. Once more business increased. The surprises continued. Al installed a sliding window for customer service. Eventually, the front door was replaced by another service window and public access to the inside of the restaurant was closed forever. Business continued to increase at Jim’s Drive-In. Al started working in the store full time in 1953 and took over management following Jim’s death in 1959. The restaurant name eventually changed to Jim’s Famous Sauce. Al worked seven days a week and finally, in 2012 at the age of 91, began to reduce his hours as Syl’s involvement began to increase after a 56-year leave of absence. Al passed away on September 28, 2017 - but he had lived a full and great life and continued to tell jokes until his last breath. 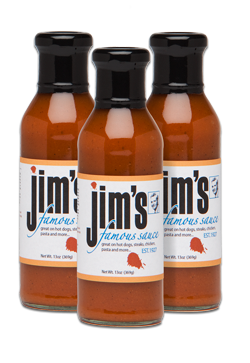 His last request to Syl was to honor their father’s goal and to continue Jim’s Famous Sauce - the spirit is alive!